Springer fishing on the Cowlitz River has been decent. It hasn’t been horrible and hasn’t been great. There’s fish here and we’ve had an uptick in recent days, but we are dealing with high and cold water and that’s made catching them more challenging. It’s been a long time since conditions were like this. They’ve dropped the water down recently, which has helped, but when we first started fishing springers this season the river was the highest I’ve ever fished it. With it being cold getting springers to bite was work. Obviously, spring Chinook like colder water. They like 52-degree water, ideally. 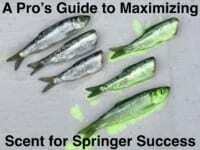 Meanwhile, when we first started springer fishing it was 42. Right now it’s about 45 and when the sun is out all day it rises to 47, maybe 48 degrees. With that being said, when it’s cold like it’s been they aren’t moving fast. They are coming up the river slow and they aren’t being aggressive. You can have fish go around you, splash next to you and right by you, but they aren’t snapping well. Fortunately, we’ve had quiet an uptick in the fishing recently because we’ve been getting nicer weather and it’s getting warmer. A consequence of the colder water is the run is later than we are used to. They forecasted 17,000 springers. So far, we’ve only got the 4,000. I expect the fishery to get better and continue to get better for a month, which is significantly later than you’d expect. Keep in mind, these are springers, not fall Chinook. Because they are spring Chinook they aren’t in a hurry, which is normal for them. They are waiting for the water to warm and when it does here they come, as we’ve seen the past few days. All of the sudden weather has gotten nicer, flows are dropping and fish are coming up. Luckily, the warmer weather is expected to continue for more than a week. That should spell more springers. The key has been for me has been overcoming several things: high water, slow moving fish and cold water, which you can do. Because the water is super high you have to find the holes where they want to bite. There seems to be certain spot where they want to bite. Those for me have been traveling spots. Where I’m getting them is before they get into their holding area. I’m catching them in areas before they reach the deeper holes. Most of my springers have been caught on Fire Brine bait. As you can see by the colors I’m using Chartreuse, Blue and chrome (Natural) have been in my boat every day. Chrome and chartreuse are my go-to baits in the morning and on overcast days. If I get bluebird, sunny days blue comes out as soon as the sun comes up. Keep in mind I’m using the Fire Brine and the Fire Dye this season. I want to make that color even hotter, which is why I’m adding the Fire Dye. You want to make that color more vivid and bright and just a small amount of the Fire Dye does that. I’m also adding a cup of salt to a quart of the brine. 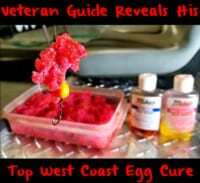 Reason being; with the high water the baits are more susceptible to breaking apart, so I’m firming them up even more with salt. The tough conditions are forcing to me to do anything I can to convince the salmon to bite. To do so, I’m adding scent to the brine. In addition to the color I want a strong scent trail out there. I’m using three scents: Fire Power, garlic and anise oil. I’m just using garlic salt, like from the store, which I can put into my brine right, just as I do with the Fire Power. However, with anise I cant put that in the brine. It must be added once the brine is done. Once the color is set overnight then I add a few drops of pure anise to it and it won’t affect the color. If I do it during the brine the anise oil will adhere to the fish and the color of the brine doesn’t take properly. Editor’s Note: Bob Kratzer operates Anglers Guide Service. 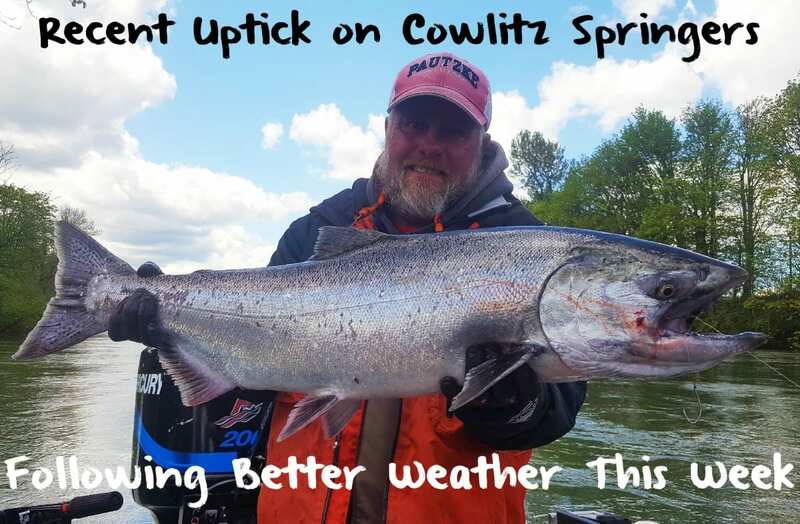 For more information on his Cowlitz River springer trips please visit http://www.anglersguideservice.com.